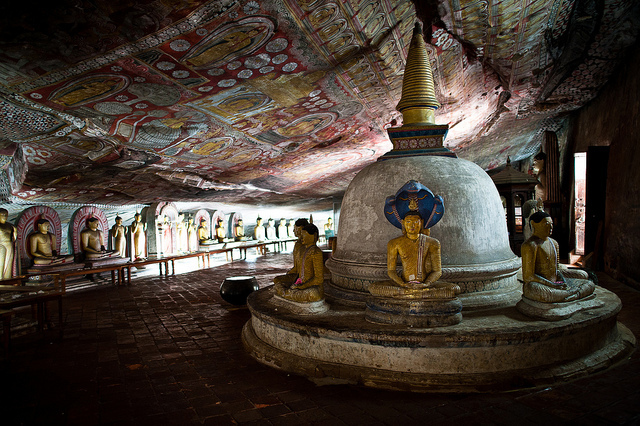 Dambulla cave temple. Around 70 per cent of the population are Buddhists. Sri Lanka’s human rights record has been questioned as a Commonwealth summit takes place in Colombo. Several Commonwealth leaders have boycotted the event, while British Prime Minister David Cameron has pledged to ask “tough questions” of Sri Lankan President Mahinda Rajapaksa. One of his lines of questioning may focus on Sri Lanka’s relationship with its religious minorities. In a country dominated by Buddhists, the Christian (approximately 7%) and Muslim (10%) minorities have complained of discrimination and attacks. Sixty-four acts of violence against Protestant Christians – many linked to extremist Buddhist group Bodu Bala Sena – were recorded between January and September of this year, including arson, church demolitions, mob attacks and assaults, reports Christian Solidarity Worldwide (CSW). The National Christian Evangelical Alliance of Sri Lanka (NCEASL) now has the figure at 65. “Pastors have been threatened, subjected to duress and forced closure of churches, various forms of discriminations… And even some Christian believers have been forced to recant their faith,” NCEASL’s Yamini Ravindran told the BBC. Meanwhile, the government has announced plans to introduce regulations against publications that “defame the original teachings and traditions of the major religions”. While outwardly a positive move, the legislation has been likened to the controversial “anti-conversion laws” in neighbouring India. The Centre for Policy Alternatives, a Colombo-based think-tank, said the proposals would “stamp a further official seal of approval on Sri Lanka’s slide towards majoritarian religious extremism and sectarian violence”. Of India’s “anti-conversion laws”, the U.S. Commission on International Religious Freedom, an advisory body to the U.S. Congress, said that “while intended to reduce forced conversions and decrease communal violence, states with these laws have higher incidents of intimidation, harassment, and violence against religious minorities, particularly Christians, than states that do not”. CSW reports that local officials in Sri Lanka have begun asking established churches to prove their legality in order to be allowed to continue operating. During a visit to Sri Lanka in September, United Nations High Commissioner for Human Rights Navi Pillay said she was “particularly alarmed at the recent surge in incitement of hatred and violence against religious minorities, including attacks on churches and mosques, and the lack of swift action against the perpetrators”. She added that the government “seemed to downplay this issue or even put the blame on minority communities themselves”. Pillay said she heard “disturbing” accounts of state protection of extremist groups and urged the government to send “the strongest possible signal of zero tolerance” for such acts by punishing the perpetrators. However, ahead of the Commonwealth Summit this weekend, Sri Lanka’s Minister of Mass Media and Communications said the country would not be bullied. “We are a sovereign nation. You think someone can just make a demand from Sri Lanka?” said Keheliya Rambukwella. The heads of state of India, Canada and Mauritius have declined the opportunity to attend the summit of 50 countries, which runs from November 15 to 17 and was opened by Prince Charles. In a recent interview with the BBC, a Sri Lankan pastor spoke of a recent attack on his church. The pastor said the monks threatened to kill the Christians and added that they would burn down the pastor’s house when they returned.